ww2dbaseUSS Helena was constructed at New York Navy Yard in Brooklyn, New York, United States in the 1930s and she was commissioned into service in Sep 1939. In late 1939 and early 1940, she made a cruise to South American, visiting Cuba, Argentina, Uruguay, and Brazil. She was later assigned to the Pacific Fleet and was present at Pearl Harbor during the Japanese attack. Moored at the berth normally assigned to battleship USS Pennsylvania, her position was particularly targeted by the Japanese, suffering a torpedo hit on the starboard side merely three minutes after the attack began. 34 were killed and 69 were wounded during this attack that brought the United States into WW2. She was moved to dry dock on the following day, and then received permanent repairs and anti-aircraft weaponry upgrades at Mare Island Navy Yard in California, United States until Jun 1942. Upon completion, she escorted ships to the South Pacific. In this capacity, on 15 Sep 1942, she was in convoy with USS Wasp when the carrier was hit by torpedoes from Japanese submarine I-19 in the Solomon Islands; Helena rescued nearly 400 survivors from Wasp and brought them to Espiritu Santo, New Hebrides. On 11 Oct 1942, Helena was the part of the US task force that ambushed an incoming Japanese fleet in the darkness of night just before midnight at the end of the day; the subsequent Battle of Cape Esperance was greatly confusing for both sides, but the Americans would achieve a small victory after sinking heavy cruiser Furutaka and destroyer Fubuki. A junior officer on Helena later wrote, "Cape Esperance was a three-sided battle in which chance was the major winner." During the First Naval Battle of Guadalcanal in Nov 1942, she was first to detect the presence of Japanese warships in the darkness with her radar, but Rear Daniel Callaghan and the task force failed to take proper action based on this information, and the battle was not joined until both sides sighted each other. In yet another confused pre-dawn battle, Helena assisted in the sinking of destroyer Akatsuki and serious damaged destroyer Amatsukaze. Captain Gilbert Hoover, commanding officer of USS Helena and the senior surviving US officer, gave the order for all Americans to disengage from battle after 40 minutes of fighting since only Helena and destroyer USS Fletcher were still in full fighting condition. Hoover would lead the task force to Espiritu Santo, New Hebrides as the acting commanding officer; en route, USS Juneau was torpedoed by a Japanese submarine, and Hoover would be relieved of duty for his decision to provide minimum rescue efforts to help Juneau's survivors. Captain Charles Cecil would be named the next commanding officer. In Jan 1943 and then again in Jul 1943, she bombarded Japanese positions on New Georgia. During the Battle of Kula Gulf in the early hours of 6 Jul 1943, she ambushed "Tokyo Express" Japanese destroyer transports, but the many gun flashes in turn made her an attractive target for Japanese gunners. She was struck by a Japanese Type 93 torpedo on the port side below No. 1 Turret at 0203 hours, breaking off the bow. At 0205 hours, she received two more torpedo hits, again on the port side. The main part of the ship sank at 0225 hours, and the bow would sink on the following day. Some of the survivors were picked up by destroyers USS Nicholas and USS Radford, some made it to nearby islands, but some others, many wounded by the torpedo detonations, would die before reaching safety. In all, of the crew of 888, 168 died in the sinking. Captain Cecil survived the sinking. ww2dbaseIn Jun 2006, remains of a US Navy serviceman were found on Ranongga Island in the Solomon Islands, west of New Georgia island. In Sep, it was determined to be the remains of Seaman 1st Class General Preston Douglas of USS Helena. His remains were buried at Gollihon Cemetery in Sneedville, Hancock County, Tennessee on 26 Jan 2008. 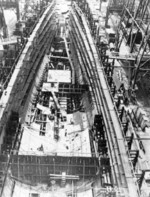 9 Dec 1936 The keel of Helena was laid down at New York Navy Yard, Brooklyn, New York, United States. 27 Aug 1939 Helena was launched at New York Navy Yard, Brooklyn, New York, United States, sponsored by Ms. Elinor Carlyle Gudger, granddaughter of Senator Thomas J. Walsh of Montana, United States. 18 Sep 1939 Captain Max Burke DeMott was named the commanding officer of USS Helena, relieving Lieutenant Commander Donald Hendry Johnston. 18 Sep 1939 USS Helena was commissioned into service with Captain Max B. Demott in command. 14 Oct 1939 USS Helena departed New York Navy Yard, Brooklyn, New York, United States for her sea trials and shakedown cruise. 22 Dec 1939 USS Helena arrived at Annapolis, Maryland, United States. 27 Dec 1939 USS Helena departed Annapolis, Maryland, United States for South America; she arrived at Norfolk, Virginia, United States later on the same day. 3 Jan 1940 USS Helena departed Norfolk, Virginia, United States. 6 Jan 1940 USS Helena arrived at Guantánamo Bay, Cuba. 7 Jan 1940 USS Helena departed Guantánamo Bay, Cuba. 13 Jan 1940 USS Helena crossed the Equator for the first time. 22 Jan 1940 USS Helena arrived at Buenos Aires, Argentina. 28 Jan 1940 USS Helena departed Buenos Aires, Argentina. 29 Jan 1940 USS Helena arrived at Montevideo, Uruguay. 3 Feb 1940 USS Helena departed Montevideo, Uruguay. 5 Feb 1940 USS Helena arrived at Santos, Brazil. 10 Feb 1940 USS Helena departed Santos, Brazil. 12 Feb 1940 USS Helena arrived at Guantánamo Bay, Cuba. 24 Feb 1940 USS Helena departed Guantánamo Bay, Cuba. 27 Feb 1940 USS Helena arrived at Norfolk, Virginia, United States. 1 Mar 1940 USS Helena departed Norfolk, Virginia, United States. 2 Mar 1940 USS Helena arrived at New York Navy Yard, Brooklyn, New York, United States. 14 Jul 1941 Captain Robert Henry English, Jr. was named the commanding officer of USS Helena, relieving Captain Max Burke DeMott. 8 Dec 1941 USS Helena entered dry dock at Honolulu, US Territory of Hawaii. 6 Mar 1942 Commander Gerald D. Linke was named the commanding officer of USS Helena, relieving Captain Robert Henry English, Jr.
29 Mar 1942 Commander Oliver Middleton Read was named the commanding officer of USS Helena, relieving Commander Gerald D. Linke. 15 Sep 1942 USS Helena rescued nearly 400 survivors of sunken USS Wasp in the Solomon Islands. 25 Sep 1942 Captain Gilbert Corwin Hoover was named the commanding officer of USS Helena, relieving Commander Oliver Middleton. 11 Oct 1942 USS Helena assumed position west of Savo Island, Solomon Islands in darkness, awaiting an incoming Japanese task force. 12 Oct 1942 USS Helena assisted in the sinking of Japanese heavy cruiser Furutaka and destroyer Fubuki. 20 Oct 1942 USS Helena observed incoming Japanese torpedoes while on patrol between Espiritu Santo of New Hebrides and San Cristobal island in the Solomon Islands; all torpedoes missed. 11 Nov 1942 USS Helena made rendezvous with a convoy of transports off San Cristobal, Solomon Islands and escorted the convoy to Guadalcanal. 12 Nov 1942 USS Helena fired on attacking Japanese aircraft at Guadalcanal, Solomon Islands. 13 Nov 1942 USS Helena detected Japanese warships with her radar off Guadalcanal, Solomon Islands at 0124 hours, but poor communications and general confusion caused a lack of proper action from the task force. The First Naval Battle of Guadalcanal was joined after the two sides sighted each other. USS Helena assisted in the sinking of destroyer Akatsuki and seriously damaged destroyer Amatsukaze. Captain Gilbert Hoover, commanding officer of USS Helena and the senior surviving US officer, gave the order for all Americans to disengage from battle after 40 minutes of fighting. 23 Nov 1942 Captain Charles Purcell Cecil was named the commanding officer of USS Helena, relieving Captain Gilbert Corwin Hoover. 5 Jan 1943 Lieutenant "Red" Cochrane and his crew of the aft 5-inch battery of USS Helena shot down a Japanese D3A dive bomber off Guadalcanal, Solomon Islands. This was the first use of proximity-fuse shells in combat. 26 Jan 2008 The remains of Seaman 1st Class General Preston Douglas of USS Helena, which were discovered on Ranongga Island in the Solomon Islands in Jun 2006, were buried at Gollihon Cemetery in Sneedville, Hancock County, Tennessee on 26 Jan 2008. MY dad, Jhn Theophile Hoffman served on the Helena before I even came along. I am very curious about the part he played in the war. Any information would be helpful, He died in 1988. Thank you for your help. Oh, he ws from New Orleans,La.. I lost many documents of my father from the USS HELENA CL 50. HIS NAME IS WALTER J COURTAULT. He was from NewOrleans La. We lost his picture of his crew on the Helena. A b d tge picture of the Helena. If possible ca some one help me with his picture of his crew. My Dad served on the USS Helena and was on it when it sank. He passed in May 2001. Any info about Herbert Harrison? My father Philip Shuh was a radioman on the Helena when it was sunk. My Dad served on the Helena during WW II. His name was Weldon Weigel. He was also called curly. Anyone know of where I can find a crew list? My uncle, Seaman First Class Leonard Franklin Tomlinson, served on USS Helena CL-50 from July 1940 until he died in the Battle of Kula Gulf. He was an artist and created many portraits and greeting cards for shipmates. I'd love to locate any survivors or their family members who may have a greeting card or portrait that Uncle Frank created or whose relative may have known him. Thank you for any clues you can provide. This is a link to the Helena's last muster list in case it is helpful to relatives seeking information on their family member or friends: http://www.usshelena.org/cl50muster1july1943index.html . My uncle was on the Helena when she was sunk.